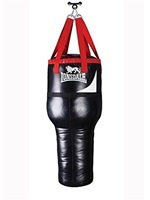 Uppercut punch bags also known as an angle punch bag or maize punch bag, are similar to heavy punch bags but shaped in a way to enable you to practice throwing uppercuts as well as the other boxing punches. If you try throwing this punch on a normal heavy bag you’ll find it’s virtually impossible to unless you’re throwing it to the body. This is the reason why angle punch bags come in different shapes and sizes. A common type would have a wide circumference at the top and from midway down the circumference will be smaller. 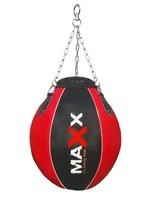 Unlike free standing punch bags, most uppercut bags will need to be hung up just like with heavy bags. There are several ways to hang a hanging uppercut bag which you can see by clicking here. 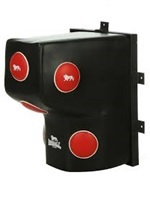 It is essential that you choose the right uppercut punching bag to ensure you get the most of your training. There are several factors you should take into account to ensure you choose the right one. Type – You may find some bags easier to throw uppercuts on than others, but with those bags it might be more difficult to throw other punches such as hooks. Check the images for the shape and style of the bag and decide what one would be more suited to your training. Also making sure you have a good pair of bag gloves suited to the type of bag you go for will ensure you have a better workout. Use – What do you want to use the bag for? Are you looking to focus on perfecting one type of punch? Or do you want a bag that’s good all round but you just want to be able to throw uppercuts. 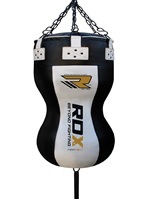 If it’s the latter then the bag style of the RDX Angled Punch Bag would be more suitable, whereas if you want to focus mainly on your uppercuts then the Maxx Wrecking Ball or Lonsdale Striking Bag would be more suitable. Length – These bags are generally going to be shorter than standard heavy bags, which makes it easier to throw uppercut shots to the body. 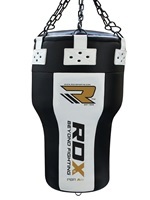 Diameter – Bags like the RDX Angled Punch Bag will have a larger diameter and circumference on the top half of the bag and smaller diameter and circumference for the bottom half. This shape enables you to throw uppercuts as the top half of the bag will stick out. Weight – The heavier the bag the more it can absorb and the less it will swing when you hit it with power. Some bags allow you to add your own filler to make it heavier or more durable. If you’re unsure whether training with an angle punching bag would be the best option for you then we’ve weighed up the pros and cons, so you can decide for yourself. Allows you to practice throwing uppercuts. Affordable and cheaper than a free standing bag. The shorter height of the bag allows you to duck down and throw uppercuts to the base of the bag. Depending on what style bag you choose, you may not be able to throw some punches as smoothly. Not as many models to choose from.